Harvest Bible Church has released a statement, explaining to its members that James MacDonald has been released from his leadership position. Oddly enough, they have retained him as a preacher and teacher, but don’t want him to help lead the church. The Elders want to do a better job of overseeing our church during challenging times. While our senior leaders have been circumspect and quiet throughout the turmoil of the Harvest Bible Fellowship transition, our Elders retrospectively wish they had been more informed and proactive. Though some errors were made by our staff (as has been graciously mentioned several times in recent weeks), our system of governance did not work nearly as well at protecting our team as we would desire. We commend Pastor James and the Senior Staff for their dedication and perseverance through this season. The Senior Staff presented a new formation of day-to-day leadership that releases Pastor James to focus on preaching and training, while the Executive Staff Team (XLT) leads the organization and reports directly to the Executive Committee of the Elders (EC). This is a healthy and purposeful step toward next-generation, shared leadership. The problem, according to our source local to Harvest Bible Church, is that nearly six hundred thousand dollars has gone unaccounted for in their operation, combined with an interconnectedness of its church plants and “satellite campuses.” Essentially, without MacDonald’s departure, the multi-site/multi-church program would have folded. 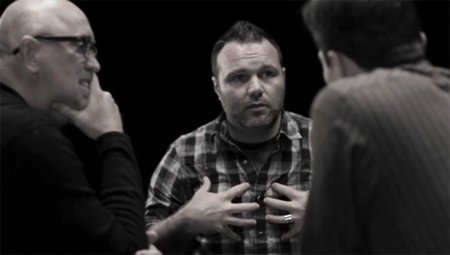 In 2014, we reported that The Social Gospel Coalition had canerized a video of Mark Driscoll, James MacDonald and Mark Dever speaking about the multi-site church model from back in 2010. Justin Taylor also wrote about that video here. In the video, both Driscoll and MacDonald patronizingly and smugly put down Dever’s painfully Biblical approach to church planting, which does not include the unscriptural satellite methodology embraced by Driscoll and MacDonald. Today, time has demonstrated through the departures of both Driscoll and MacDonald from their place of leadership, who was right. Satellite methodology may lead to quick “growth” but lacks the Biblical foundation needed for long-term sustained growth and a healthy pastorate. By the way, even though that video from The Social Gospel Coalition was canerized, we still have the audio, because it was reviewed by JD on this episode of Polemics Report. As far as we know, it’s the only place online you can still hear Driscoll and MacDonald practically making fun of Dever for not supporting their novel ecclesiology.